When I picked Laos out of the box I was utterly thrilled, Mum always raves about Lao food and tells me all about traveling in Laos with Dad in the 90’s. Located in Southeast Asia it has many bordering countries and is also landlocked. 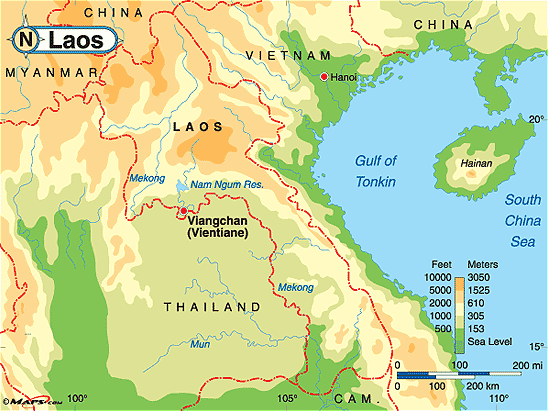 In the 14th century Laos was known as the kingdom of Lan Xang, after four centuries it then split into three kingdoms. In 1893, when Laos came under French rule with the three kingdoms (Luang Phrabang, Vientiane and Champasak) it finally came together to form what is now modern-day Laos. Sadly Laos ranks as the 25th hungriest nation in the world this being because a third of the Lao population live below the international poverty line which is living on less than US $1.25 per day. The most commonly eaten food in Laos is sticky rice, the Lao even like to call themselves the “luk khao niaow”, which in English means “children or descendants of sticky rice” Let’s just say they love their sticky rice.The two most famous dishes from Laos are Larb which is a spicy meat mixed salad and green papaya salad, Tum Mak Hoong, or Som Tam Lao. So I looked at some different recipes and I decided on a Luke Nguyen recipe off the SBS website: Pork and Buffalo patties with sticky rice though I thought I’d opt for beef instead of buffalo, here’s the page www.sbs.com.au. Also I chose to serve the patties with a dipping sauce, for which I used this recipe, roasted-tomato-dipping-sauce and I also made a salad to accompany it all – lao-mixed-salad . Pound the shallot and lemongrass to a paste in a large mortar. Transfer the paste to a mixing bowl and add the remaining ingredients. Mix together well, then shape into 12 patties, about 6 cm (2 inches) across and 2 cm (1 inch) thick. Chill. Heat a barbecue chargrill or chargrill pan with 1 TB oil, to medium-high. Cook the patties for 3-4 minutes on each side, or until browned and cooked through. Serve the patties hot, with sticky rice, and salad, delicious dipping sauce, or Thai sweet chilli sauce. Separate the yolk and white. Thinly slice the white. Put the yolk in a small bowl, add the vinegar and honey and whisk or use electric beater and beat until smooth. While beating, slowly pour in the 2 tablespoons plus 2 teaspoons of oil. Season with salt and pepper. In a medium frypan, heat ¼ inch of oil. Add the shallot rings and fry over moderate heat, stirring a few times, until golden brown and crisp, about 3 minutes. With a slotted spoon, transfer the shallot rings to paper towels to drain. Add the garlic to the hot oil and fry, stirring a few times, until golden, about 1 minute. Transfer the garlic to the paper towels. In a large bowl, drizzle the tomato and cucumber slices with 1 tablespoon of the dressing and toss gently. Arrange the slices around a platter. Add the mixed salad, watercress and sliced egg white to the bowl, top with the remaining dressing and toss well. 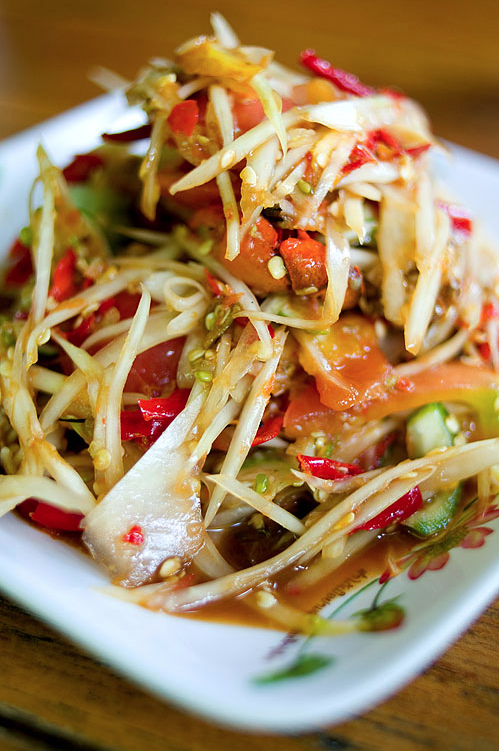 Mound the salad on the platter, garnish with the peanuts and the fried shallot and garlic and serve. In the recipe it calls for a grill, but ours is broken at the moment, so we opted for charring our vegetables in a smoking hot pan with a little olive oil. Also in the recipe it says to use 12 garlic cloves which I didn’t do – Mimsey said “No way!” So I only used 4 cloves, as my family didn’t want garlic breath for the next week. If using a grill – Soak skewers in water for at least 30 minutes to prevent burning. Cut onions and chillies into 2-inch pieces (leave cherry tomatoes whole if using) push skewers through all the vegetables. Grill for about 15 minutes, until nicely charred but not burnt. If using a pan – Heat a small frypan pan on medium-high heat, when hot add the oil and fry the vegetables till softened and charred. about 5-10 minutes. If using a mortar and pestle – Using mortar and pestle, pound charred chilies, garlic and onions until all are well mixed and mashed. Add cooked tomatoes and the rest of the ingredients, lightly mix. 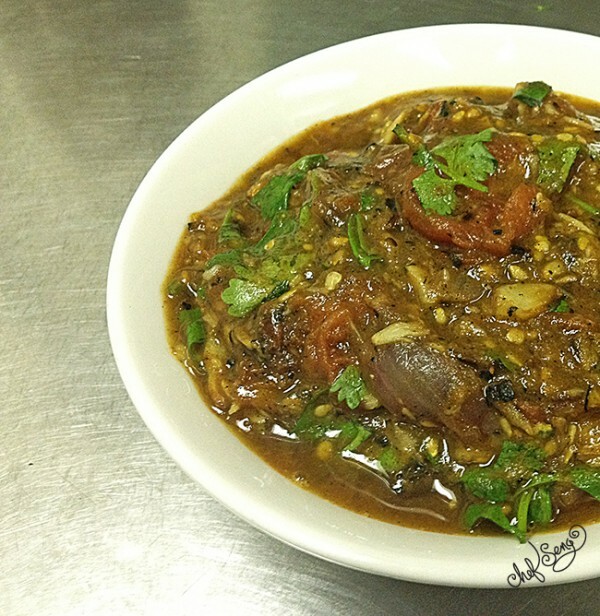 Stir in coriander. If using a food processor – Place all ingredients except coriander in the food processor and whizz briefly till rough and still chunky, about 10 seconds. Stir in coriander. Served all together, this meal was delicious and one we won’t forget for a while. Mimsey helped me make this meal as there was so many elements and things to do, so thank you Mims. As usual it all took heaps longer to do than I thought, but it really was worth the effort! Score was 10/10 for everyone!